Many organizations that implement organization-wide ERP software underestimate the importance of ERP end-user training. Some organizations consider implementing end-user training, but end up using inefficient training methods. This may lead to the failure of ERP implementation. While classroom training limits the number of participants, self-learning method is not ideal for all. So, what can be an ideal method to deliver ERP end-user training? The answer for this question would be the ‘Watch-Try-Do’ approach. Today in this blog, we will know what this ‘Watch-Try-Do’ approach is all about, why this approach for ERP end-user training, how it can be used, and which tool to go for. This is a 3 stage approach where in the first stage (watch), learners view how a thing works; in the second stage (Try), they are given a chance to attempt it under some guidance; and in the third stage (Do), they are asked to do it by themselves. This simulated approach works for things that are complex and tough to understand. It gives learners opportunities to practice with and without guidance until they become completely confident. Why ‘Watch-Try-Do’ simulations for ERP end-user training? Most of the ERP software applications are complex, and users must have a good understanding of the software to make the best use of it. One mistake could take a long time to rectify. In order to ensure maximum precision in the usage of the software, users must be given opportunities to practice. The ‘Watch-Try-Do’ approach provides effective hands-on training in a risk-free environment. Hence, through these software training simulations, organizations can ensure that end-users are well-trained on the complex steps involved. How can we use this approach of software training simulations in ERP end-User training? 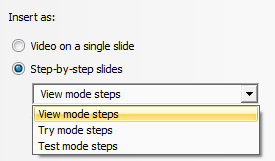 You can take screencasts of the steps of each task to be performed in the software. The screencasts can be used in the watch stage to demonstrate the task. It is then used to create the try and do stages of the ‘Watch-Try-Do’ approach. Years ago, developing ‘Watch-Try-Do’ simulations was a tough and tedious task as they were developed using screencast and video editing applications. But since the advent of e-learning authoring tools, these software training simulations are developed with much ease. Which tool can provide the best Watch-Try-Do software training simulations? There are a number of e-learning rapid authoring tools in the market. Some specialize in developing software training simulations and others provide it as an additional feature. Articulate Storyline is one of the e-learning rapid authoring tools known for its highly built-in interactive features and great ability to develop ERP software training simulations. 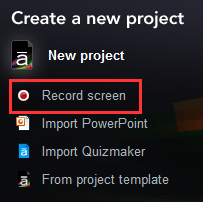 It provides two options – you can use the screencast as a video; or you can divide the screencast into step by step chunks. For this, you don’t need any video editing application. Once you capture the steps using the authoring tool, it automatically breaks it down into step by step chunks with instructions in callouts on each step. This is how the ‘Watch-Try-Do’ approach provides effective ERP end-user training and Articulate Storyline comes in handy developing it. Hope you find this post helpful. Please share your thoughts through your comments.